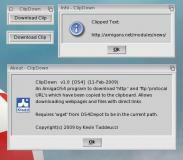 Description: Utility to download/play URL's from the clipboard. output window. See the history below for a full list of new features. Added support for supplying URL on command line with -u option. 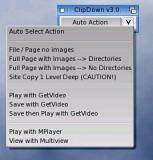 ClipDown can now be run from context menus such as from MUIOWB. Added .f4v as supported video format. vtuner.com  (Click "Browse Station List"  then pick station type. Added support for playing .webm video format to Auto Action mode. startup via a requester. See top of file for user settings. Added support for playing video links provided by www.savefrom.net.